The following collection of photos have been collected from our members and reflect their activities regarding cacti and succulent plants. Some have been part of our club newsletter stories and others are direct from member's personal collections. The photos can be viewed in a larger format by clicking on the photo with your mouse. After viewing the larger image you can return to this page by using the back button of your browser. We hope you enjoy the pictures and comments are always welcomed. Echinocereus baileyi now classified as a variety of Echinocereus reichenbachii, but it remains as one of the most winter hardy of all the echinocereus. It grows naturally in northern Texas and into western Oklahoma and can easily withstand temperatures below freezing. The plant shown was grown from seed and is planted in a one gallon nursery pot, ready for planting in an outdoor, winter hardy planting in Maryland. Given enough sun and a well drained soil E. bailey is easy to grow and readily forms attractive clumps. As seen in the photo, the flowers are wonderfully large, colorful, and produced in abundance. If you live in an area where winter temperature rarely go below 20 degrees this would be a plant you should try. 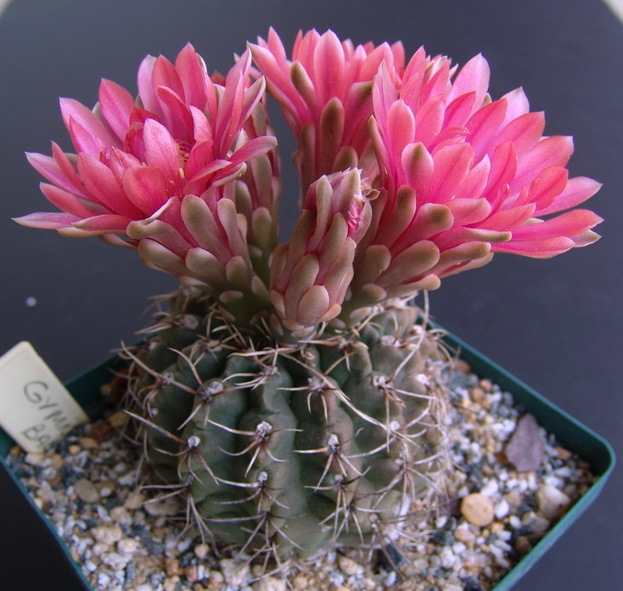 As a genus Gymnocalycium offers a lot to the grower. They are relatively small plants that don't take up too much space. Most are easy to grow and very undemanding. Most flower easily and have attractive flowers. 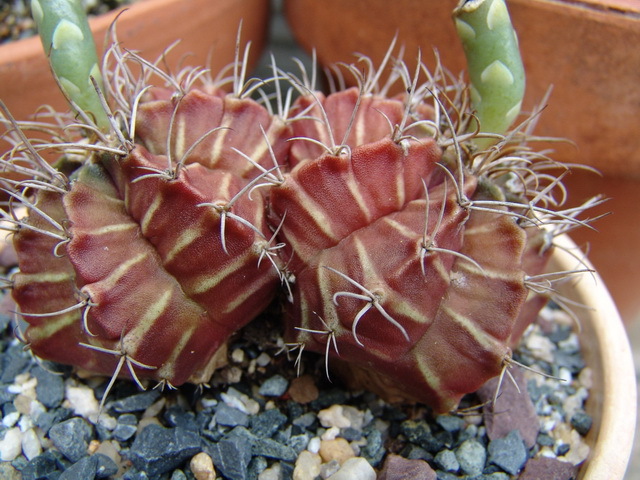 Gymnocalycium baldianum is rather unusual in the bright red flower color. Very few gymnocalyciums have such a bright, cherry color. Gymnocalycium baldianum matures as a relatively small plant, maxing out at about 2.5 to 3 inches in diameter. It is a well-known species and easy to grow and flower. 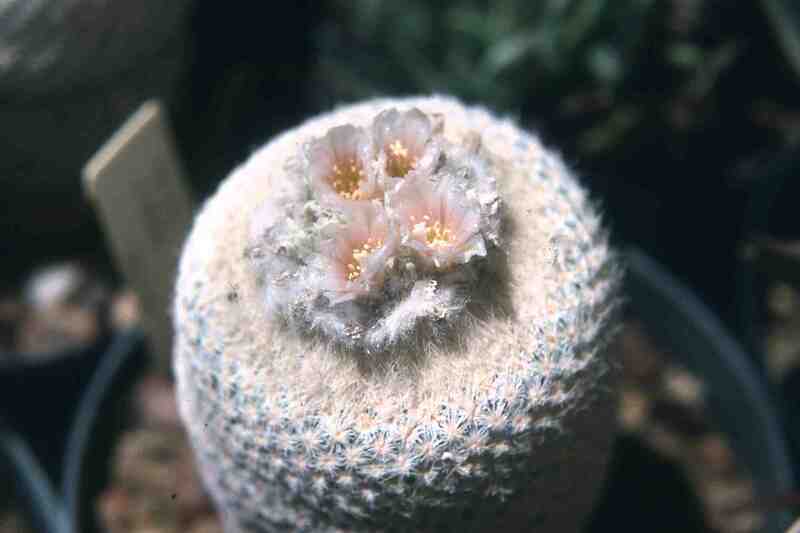 While the plant body is typical gymnocalycium, the flowers are one of the most attractive in the genus. It's native to Argentina in South America. This is a plant from the Plant Show of the recent 17th Eastern Cactus and Succulent Conference in Waterbury, Connecticut. This type of plant is known as a caudiciform, which is a plant that develops a swollen root or lower stem (called a caudex) that stores water. Some caudiciforms produce their caudex below ground, other produce theirs above ground. 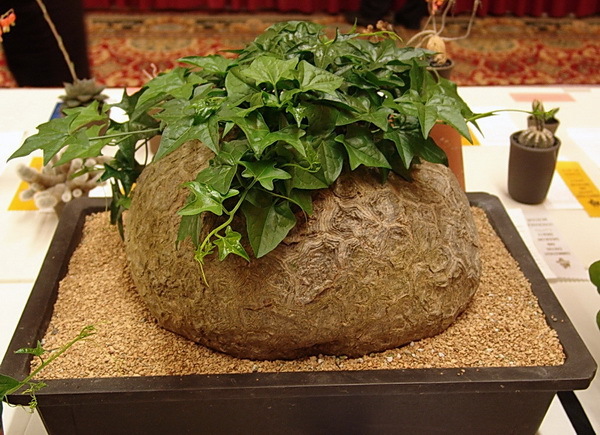 Most growers prefer to have the caudex above ground where it can be seen. Gerrardanthus macrorhizus is in the Cucurbitaceae family and is native to South Africa. The caudex grows reasonably quickly if the plant is kept warm, given partial shade, and plenty of water. 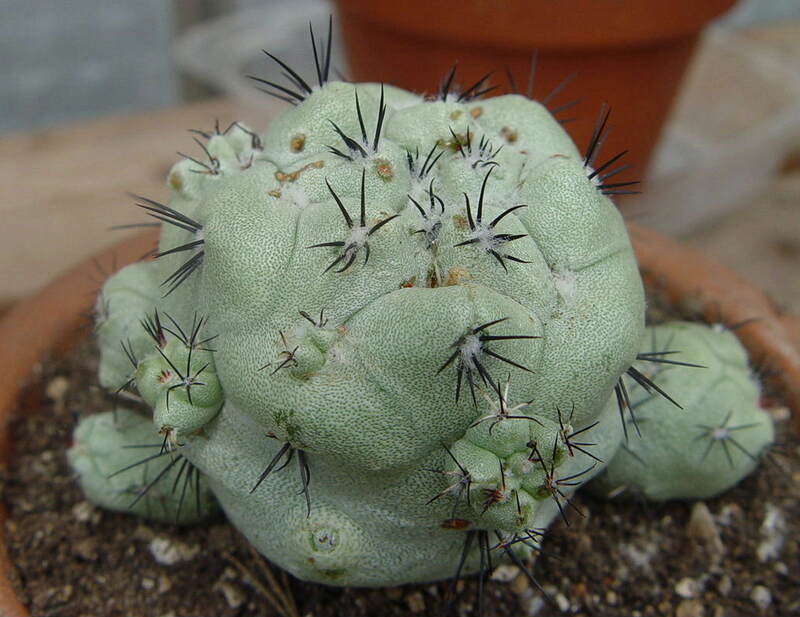 As a genus Gymnocalycium offers a lot to the grower. They are relatively small plants that don't take up too much space. Most are easy to grow and very undemanding. Most flower easily and have attractive flowers. G. mihanovichii is particularly nice for its attractive body coloration, as shown in the plant on the left. This was an unusual plant grown from seed by one of our members in that it produced a double stemmed plant. The grower was positive it wasn't two seedlings that just grow close together. Whatever the origin, a very attractive plants. This is another photo taken in habitat. 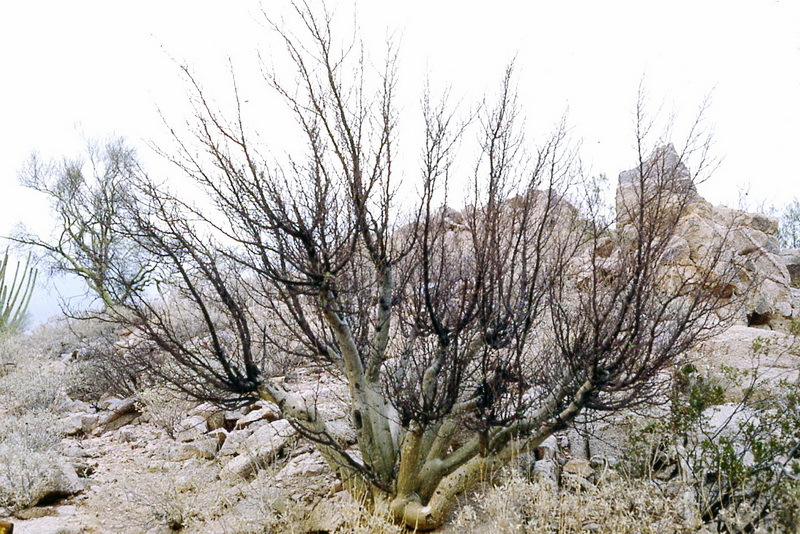 The plant is Bursera microphylla and the location in Organ-Pipe National Monument in southern Arizona. It is also native to northern Mexico, Baja California, and Southern California. Commonly known as the "Elephant Tree" B. microphylla is a member of a group of plants known as caudiciforms. These plants have enlarged or swollen trunks or branches. Many cacti and succulent growers seek out caudiciform plants, plant them in ornate pots, and treat them much like bonsai subjects. Lithops are almost always popular but many growers have difficulty growing them. 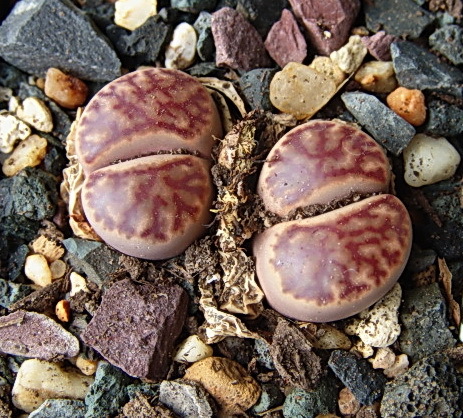 Lithops bromfieldii is one of the easier lithops to grow successfully. This pair was grown from seed by one of your members is is approximately 8 years old. Lithops are summer growers and should be watered from spring when their new leaves appear until fall when their flowering is complete. They are kept completely dry the remainder of the year. Over the winter their old leaves loss moisture and begin to shrivel. This is the danger period for lithops. They appear to need watering but you must keep them dry. Watering over the winter almost always results in a mushy, dead plant. 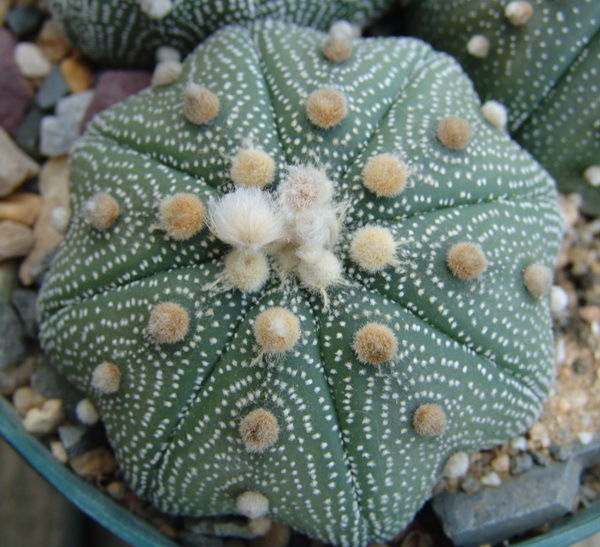 One of the most popular of all cacti over the past few decades has been Astrophytum asterias. Every now and then a slight unusual form is discovered and makes its way into cultivation. The plant on the left exhibits what is known as the "star" form of Astrophytum asterias. Instead of being round in shape, the "star" form has a somewhat irregular, or wavy, edge. In general Astrophytum asterias is a bit touchy in terms of cultivation. It must have a very well drained soil and it resent being kept wet for extended periods of time. It often displays its resentment by a rapid rotting. A. asterias doesn't require as much direct sunlight as other astrophytums, and does best when provided with a little light shade during the mid afternoon. This is a member of the Aizoaceae plant family, which was once known as the Mesembryanthemaceae family, and is native to South Africa. The unique thing about this plant is that it is perfectly winter hardy in the Washington, D.C. area. 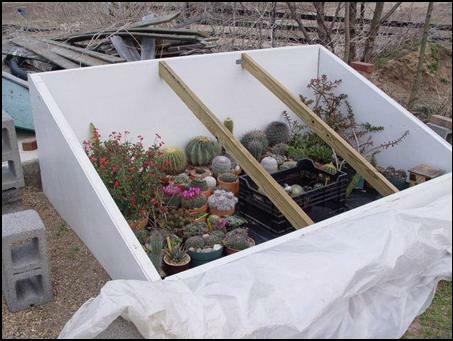 The photo at the left was taken in the outdoor cacti and succulent bed of one of our members. The plant has been growing outside, all year, since 2005. It's easy to grow and when given at least 6 hours of direct sun daily it will flower throughout the summer. This photo was taken at a picnic area along Interstate 20 between Ft. Worth and Abilene Texas. Echinocereus reichenbachii is one of the most attractive cacti native to the United States. While it has very attractive flowers the spines and clustering habit of the plant are also great. Member Bob Stewart took this photo during a trip to the Southwest in the late 1980's. grown outside during the frost free parts of the year and then brought inside to a sunny window from mid fall through mid spring. 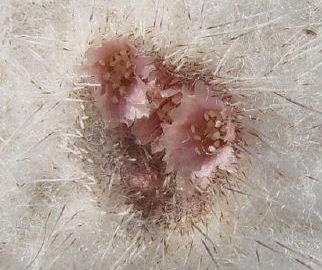 This picture is from a plant in club member Bob Stewart's collection and demonstrates the rock-like appearance of this species. Bob grows most of his plants from seed and this plant is 12 years old from seed. Astrophytum myriostigma (the bishop's cap cactus) is native to Mexico where it grows on hillsides of limestone rock where it blends in wonderfully with its surrounding. Often when a succulent grows in a cyptic manner (blending in with the background) it has small or no spines. Bob's plant is showing a flower bud that will open to a large 2 to 3 inch diameter yellow flower. 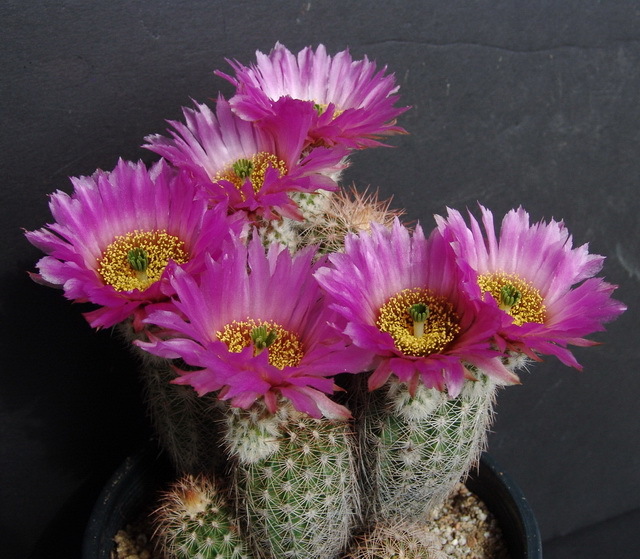 This is the "button cactus" flowering in the collection of one of our members in December. The plant is small, only an inch and a half in diameter and the flowers are even smaller. E. micromeris is relatively common throughout a good part of West Texas and Southern New Mexico, although due to its small size it is often difficult to find. It is also easy to grow providing it receives a lot of sun and a gritty, very well drained potting soil. Sometimes it's hard to appreciate the smaller cactus flowers from eye level. A close up lens on the camera can help show the flower of Epithelantha micromeris is more detail and reveal its beauty. 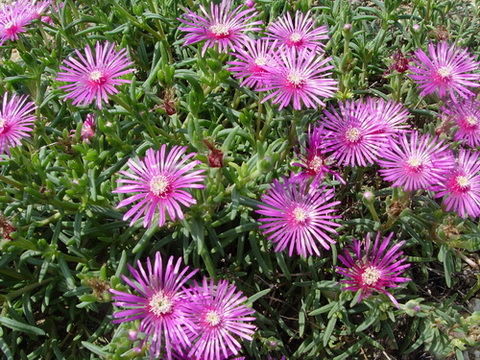 The flowers shown here are less than one quarter inch across. This is a members cheap alternative to a greenhouse. It's a cold frame to which a small, electric heater as been added to overwinter plants in Maryland. The frame measures 8 feet wide by 5 feet long and is covered by a sheet of 6 mil clear plastic. A 1500 watt space heater, connected to a thermostat provides heat. The thermostat is set for a 40 degree minimum. The story of the frame was in the October 2006 newsletter. 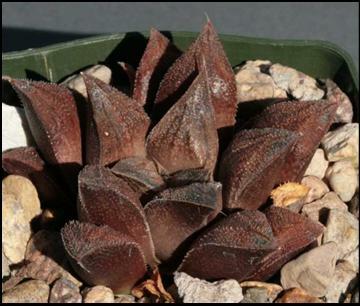 This is a very colorful haworthia cultivar to grow and was featured in our December 2006 newsletter. One of our members had purchased this plant from the Nursery of Steven Hammer and then lost the plant when his house was hit by a tornado! Cacti In The Snow - In Maryland! 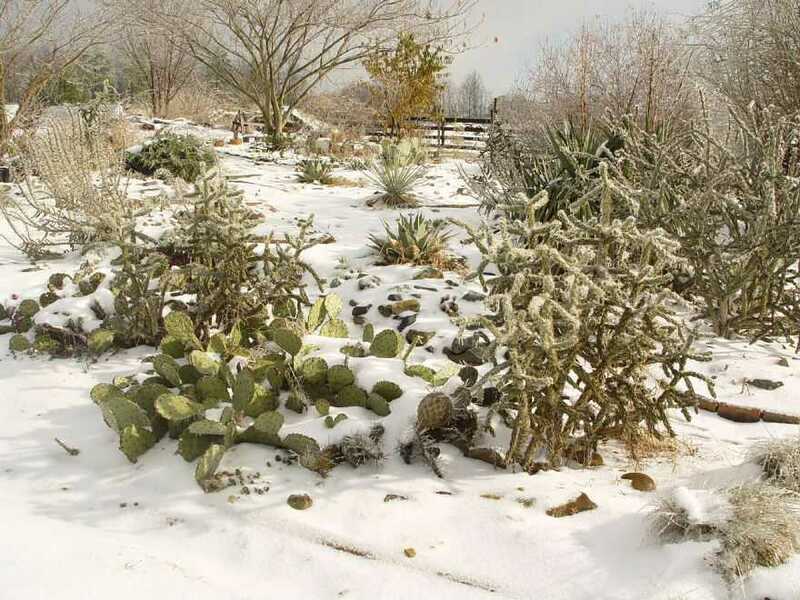 Yes Virginia, cacti can be grown where it snows, including the Eastern parts of the U.S. This photo was taken in one of our member's yards in Maryland. The plant in the right foreground is Cylindropuntia imbricata. In the left foreground is Opuntia phaecantha. Both of these cacti are cold and snow tolerant, at least in the Mid Atlantic region. Click on the photo to see a larger version. 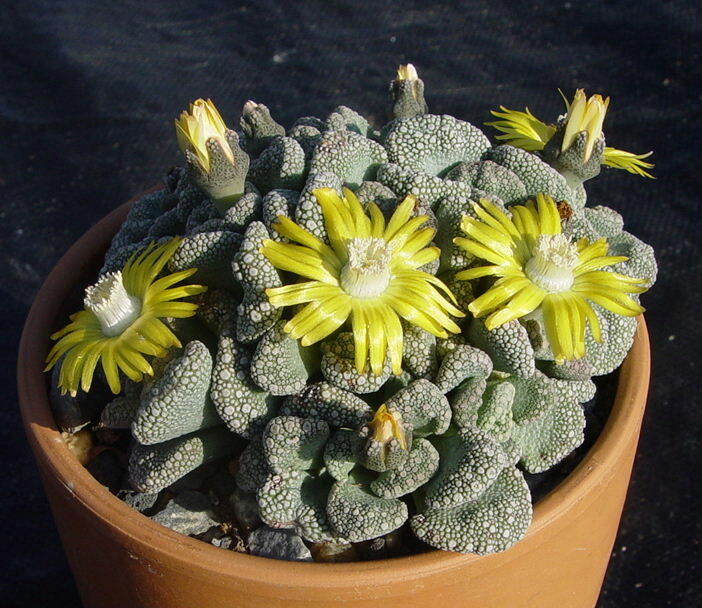 It's interesting that for some growers the mesembs, such as Titanopsis calcarea, are very difficult to grow well, and yet for others they almost seem to grow themselves. However, there is no doubt when growing well, and flowering, they are among the most beautiful and interesting of succulent plants. The plant pictured here is grown outdoors in full sun during the frost free part of the year and spends the winter in the heated frame shown at the top of this page. This photo was not taken in Arizona or Texas, but in Charles County in Southern Maryland. The Agave pictured here is part of a hardy cactus and succulent garden. There are actually quite a few cacti and other succulents that are winter hardy here in the eastern U.S. This agave was grown from seed, is 14 years old, and has been in the hardy cactu planting since 1996. This habitat photo was taken at Dagger Flats in Big Bend National Park in Texas. 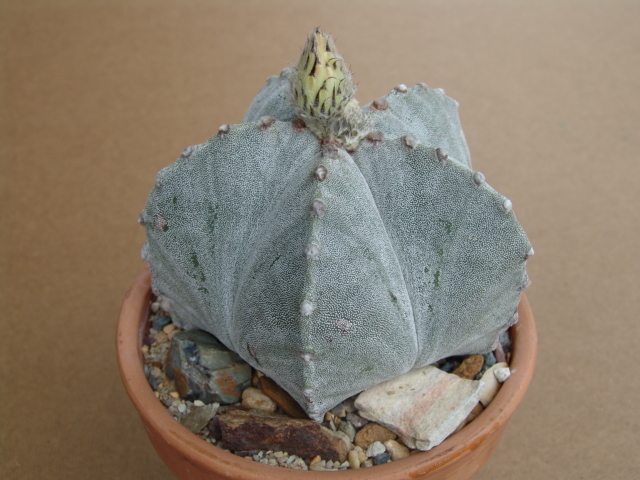 Ariocarpus are known as "Living Rock" cacti and when not in flower they blend into the rock covered ground so well they are often very difficult to find. 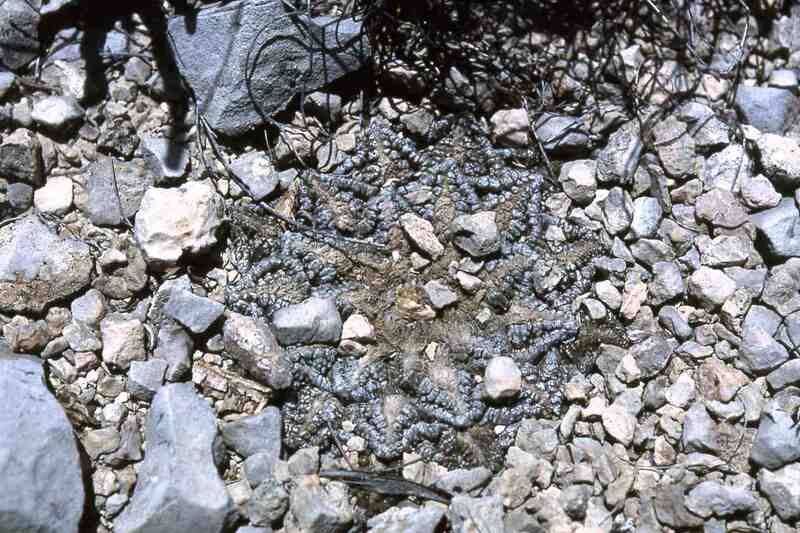 Ariocarpus is unusual for cacti in that it flowers in late summer and early fall. 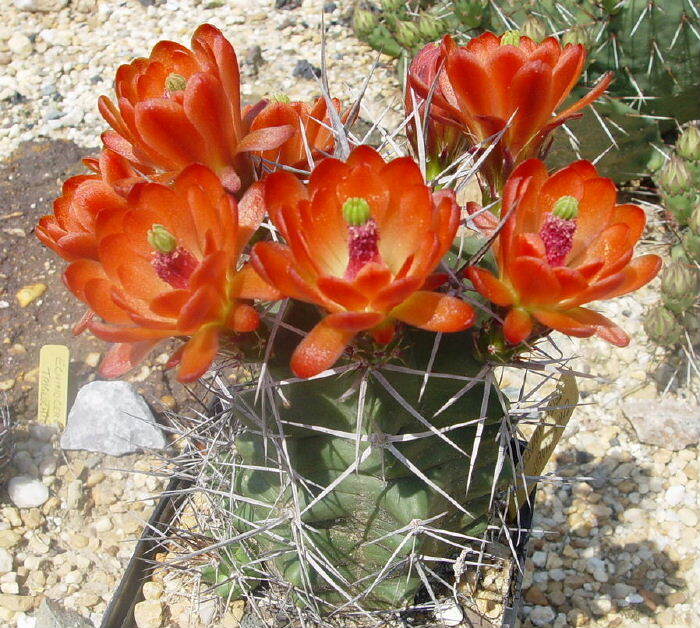 The common name of E. triglochidiatus is the claret-cup cactus; in reference to the deep red (scarlet) flower color. It's native throughout a large portion of the U.S. Southwest and Mexico. This plant is growing in one of our member's yards. While it is in a pot, it remains outside all year. Many of the echinocerei are winter hardy in the mid Atlantic area provided they have excellent soil drainage. This plant was grown from seed obtained from Mesa Garden, a nursery specializing in cacti and other succulent seed and plants. How do you get an echinocereus plant to flower? Just give it sun, sun, and more sun. This plant is the result of a successful "plant rescue." One of our society members was asked if he wanted a large euphorbia plant. The plant had been in the possession of an elderly lady for more than twenty years and had grown well, but during the past few years the lady had been sick and the plant had barely been watered. There had been more than twelve stems but eight had shriveled and died. The lady didn't want the plant to die and contacted our society for help. Instead of trying to revive the plant our member took a cutting from the healthiest stem and worked on rooting the cuttings and developing a new plant. The plant shown at left is a result of their efforts. With a new pot, fresh potting soil, lots of sun and regular watering, Euphorbia polygona 'Snowflake" is once again looking very nice. The "Senita Cactus" is one of the rarest cacti in the American Southwest. While common in Mexico it only occurs in a tiny portion of the Organ Pipe National Monument in extreme southern Arizona, right along the Mexican border. The Senita grows long bristles from the aeroles of the flowering stems, giving the tops of the stems a distinctly bristly, fuzzy appearance. The Senita also produces several flowers per each aerole. 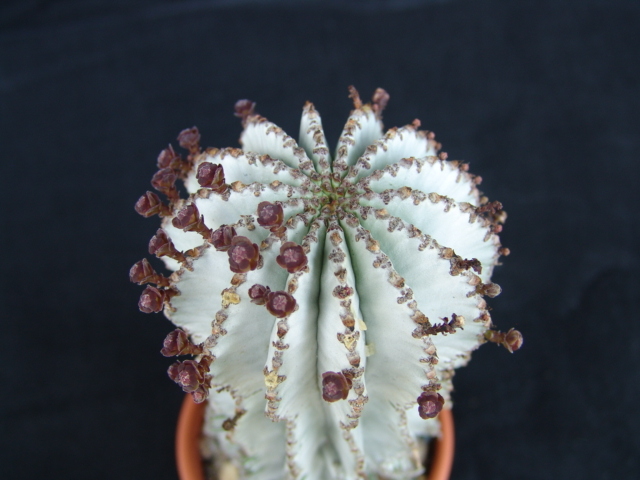 Most cacti only produce one flower per aerole. This photo was taken in Organ Pipe National Monument by member Bob Stewart. This is one of the most unusual and least understood of all cacti. It was discovered in 1952 by Tom MacDougall in Mexico. Since that time botanist have been unable to associate it with any existing genera and thus is placed in its own genus. 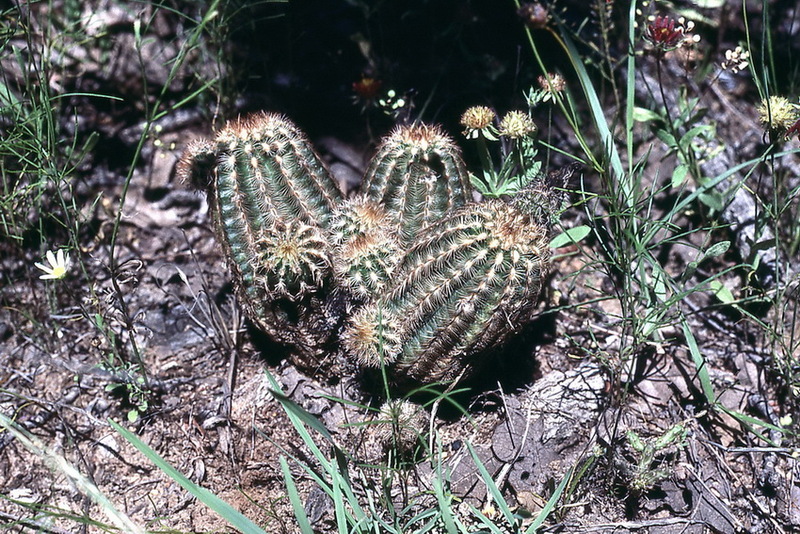 The genus name Ortegocactus honors the Ortega family in Mexico who assisted in the plant's discovery. At maturity this is a small plant, seldom growing to more than 2 inches in diameter. Its flowers are yellow and approximately 1 inch in diameter. The plant pictured is in the collection of one of our club members living in the Baltimore, Maryland area. This is the organ pipe cactus in habitat in Organ Pipe National Monument, Arizona. it was originally known as Lemaireocereus thurberi but time and taxonomy have taken their toll and the genus Lemaireocereus is no more. Unlike the other famous, big cactus of Arizona, the saguaro, the organ pipe produces multiple stems from the ground and tops out in height about about 15 feet. This photo was taken by one of our NCCSS members while visiting Organ Pipe National Monument. Many consider this the most attractive of all the echeverias. 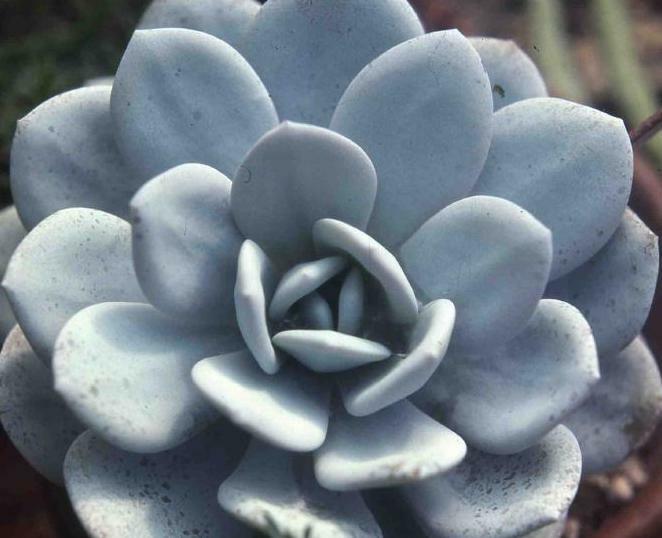 The leaves have a lovely bluish tint and are pleasingly plump and symmetrical around the plant center. Unfortunately, the bluish color is due to a powdery coating (called a glaucous bloom) on the leaves and this powder is easily marred by touching the leaves. Despite its beauty E. laui is seldom seen in shows due to the fear of the pointing, touching, and smearing fingers of show visitors. E. laui is not an easy echeveria to grow. It is very sensitive to over-watering and will often rot at the sight of the watering can. The flowers are in the form of orange bells hung over the plant on a six to eight inch stalk. The plant show was grown by member Bob Stewart and lost in 2002 when a tornado hit Bob's house and C&S collection!